Role lidského kapitálu v úspěchu na trhu práce: srovnání šesti evropských zemí participujících na projektu PIAAC | Sociologický ústav AV ČR, v.v.i. Matějů, Petr, Petra Anýžová. 2015. 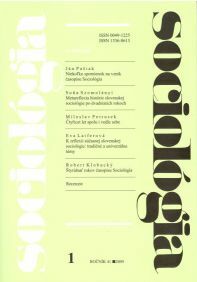 „Role lidského kapitálu v úspěchu na trhu práce: srovnání šesti evropských zemí participujících na projektu PIAAC.“ Sociológia – Slovak Sociological Review 47 (1): 31–65. ISSN 1336-8613. Dostupné z: http://www.sav.sk/index.php?lang=sk&doc=journal-list∂=list_articles&journal_issue_no=11113634#abstract_10945. The Role of Human Capital in Labour Market Outcomes: A Comparative Study of Six European Nations Participating in the PIAAC Project. The main objective of the paper is to examine the role of measured competencies in labour market outcomes in two groups of European nations (the Czech Republic, Slovakia and Poland on the one hand, and Denmark, the Netherlands and Belgium on the other) that differ not only in their long term historical development, but also in their current orientation toward innovations, labour market flexibility, the openness of tertiary education and gender equality. The results of structural modelling based on data from the PIAAC (adult competencies) project of the OECD provide strong evidence for the hypothesis that the direct positive effect of competencies on labour market outcomes (namely on wages) are stronger in innovation-oriented countries, while the transitive (Central European) countries exhibit a stronger tendency towards factors typical for a “credential society” (characterised by the stronger role of formal education and larger wage gender gaps).